By repairing printed circuit boards, manufacturers can recycle and reuse expensive components that otherwise would be scrapped. At HVT, your defective PCBs are repaired to like-new condition and returned to you in a matter of days for use as replacement parts. 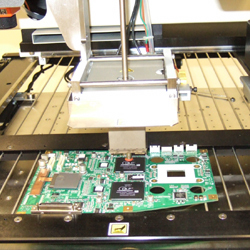 We repair PCBs from DLP products and most other types of PCB boards including main boards and power supplies. To deliver the fastest, most economical and highest quality service, we use high-technology PCB rework equipment to automatically insure a consistent and reliable repair process regardless of the type of PCB we are asked to repair or rework. Because the equipment is programmable, it's ideally used for repeatable rework and repair, which makes HVT the ideal partner for mass quantity rework of factory defects or rejects. Also for PCBs, HVT can provide complete lead-free soldering that is RoHS compliant, or optionally use more traditional lead-based soldering methods. Cost-effective rework and repair of all BGA and QFP components on boards up to 18" x 22"
For new accounts, please contact inquire@HVTnet.com or call 770-495-4881 for initial account start-up. There is no start-up cost to the customer.